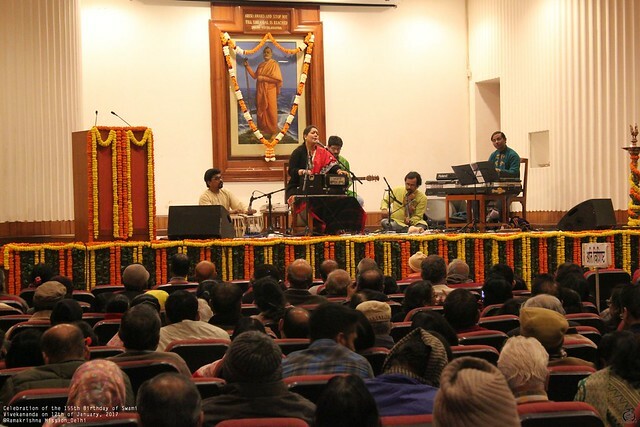 On the auspicious occasion of the National Youth Day synchronizing with the 155th Birthday of the Patriot-Saint of modern India, Swami Vivekannda, a cultural festival was jointly organized by Sangeet Natak Academi and Ramakrishna Mission, New Delhi, on 12th January 2017, in the Vivekananda Auditorium of the Ramakrishna Mission. 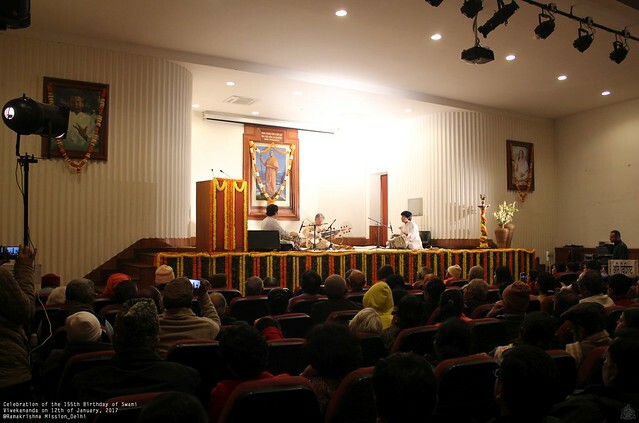 On 12th January, with the announcement made by Ms Mridhula Tripathy, the pogramme started at 10.00 a.m. with its inauguration by Swami Shantatmanandaji, Secretary, Ramakrishna Mission, New Delhi, who lighted the lamp and delivered his Inaugural Address. 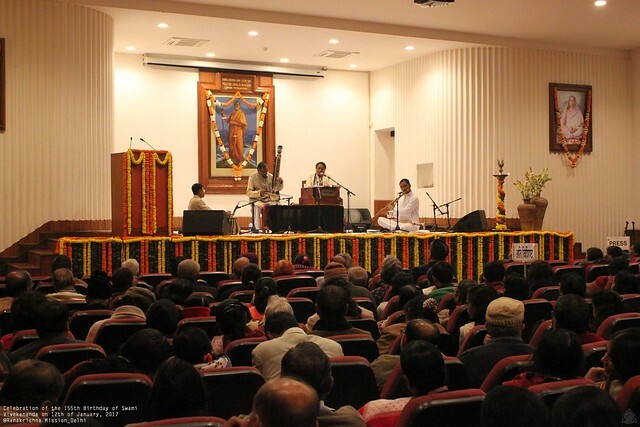 Then the programme continued with the Hindustani vocal recital by Dr. Ashwini Bhide Deshpande, accompanied by Shri Vinod Lele on tabla, Shri Vinay Mishra on harmonium, Shri Anurodh Jain on apex and Smt. 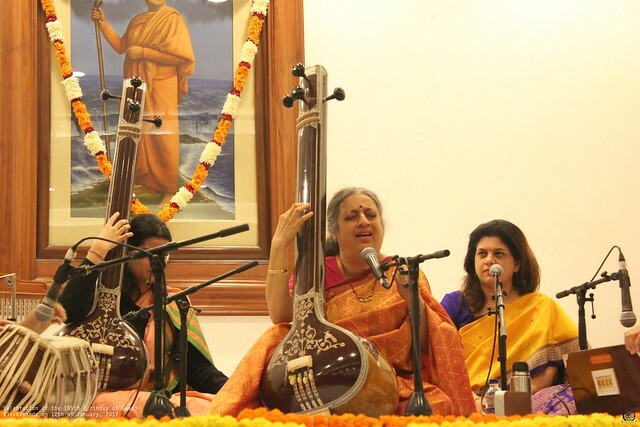 Sweta Kilpad with vocal support and Ms Deepika on tanpura. 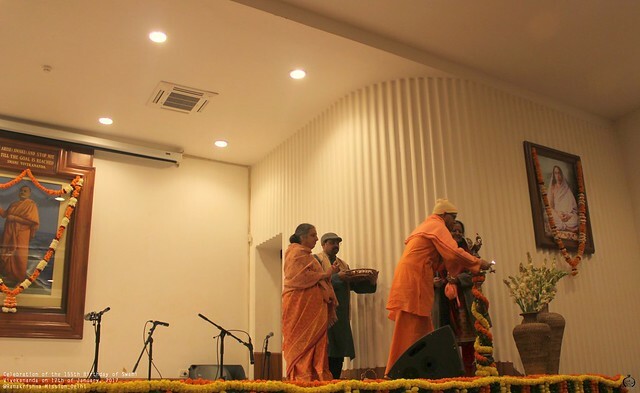 At the end of this programme, Swami Shantatmanandaji spoke a few words of appreciation for the performers and presented a shawl, an Uttariya and a table calendar to Smt. Ashwini Bhide Deshpande and also an uttariya along with a table calendar to each of the other accompanying artistes. The next programme started with the performance by Shri Shekhar Kanti Kar on Esraj accompanied by Shri Debabrata Mandal on tabla, Smt. 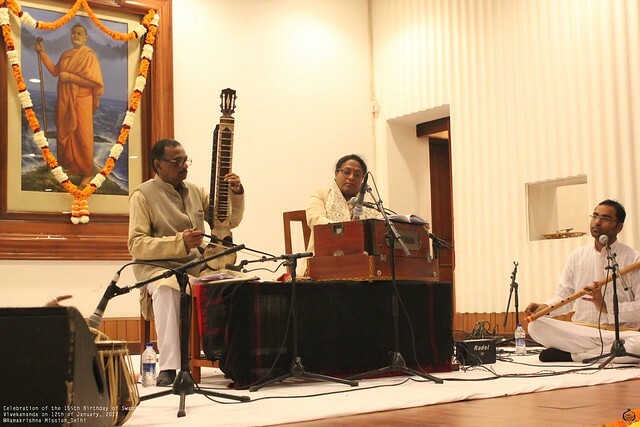 Durga Bhattacharya on harmonium and Shri Siddhartha Behra on flute. 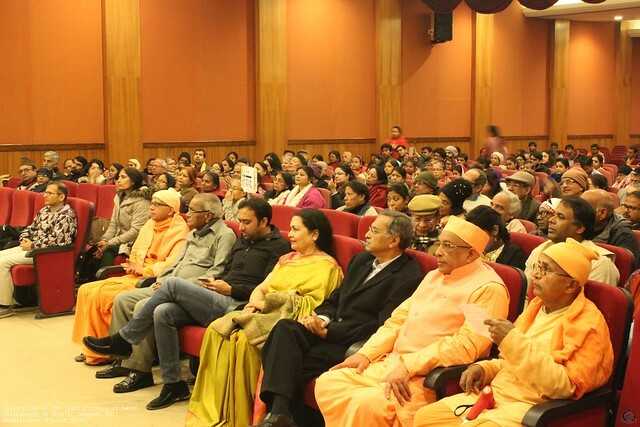 At the end of this programme, Swami Shantatmanandaji spoke a few words of appreciation for the performers and presented a shawl and an uttariya along with a table calendar to Shri Shekhar Kanti Kar and an uttariya along with a table calendar to each of the other accompanying artistes. This was followed by the next programme – Rabindra Sangeet by Smt. 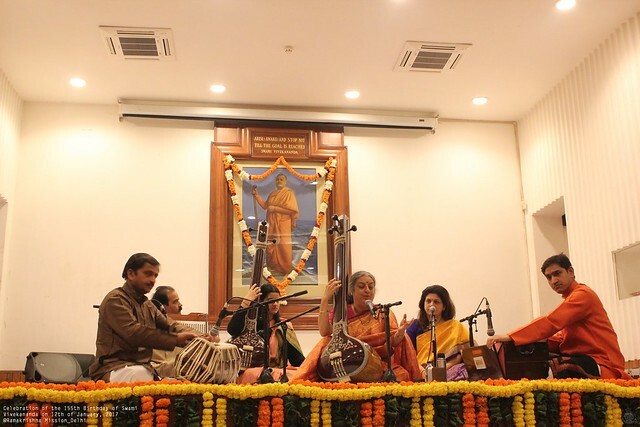 Jayanti Chakraborty accompanied by Shri Joydeep Nandi on tabla, Shri Surajit Das on keyboard, Shri Subrato Banerjee on guitar and Shri Amlan Haldar on violin. 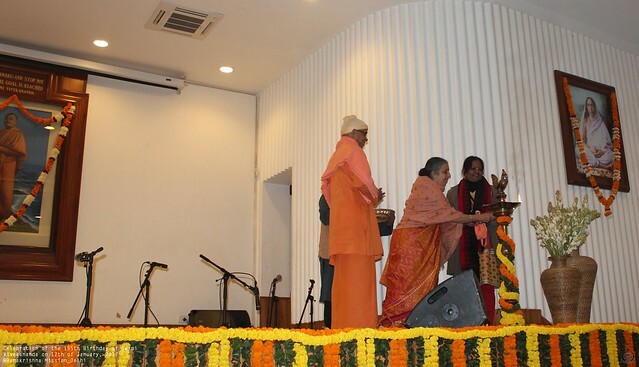 At the end of this programme, Swami Shantatmanandaji spoke a few words of appreciation for the performers and presented a shawl and an uttariya along with a table calendar to Smt. Jayati Chakraborty, and an uttariya and a table calendar to the other accompanying artistes. 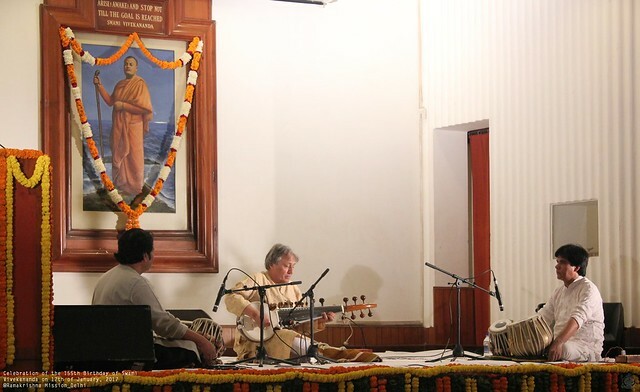 After the performance of Rabindra Sangeet, there was Sarod recital by Ustad Amjad Ali khan accompanied by Ustad Rashid Mustafa Thirakwa on tabla and Pandit Mitulesh Jha also on tabla. 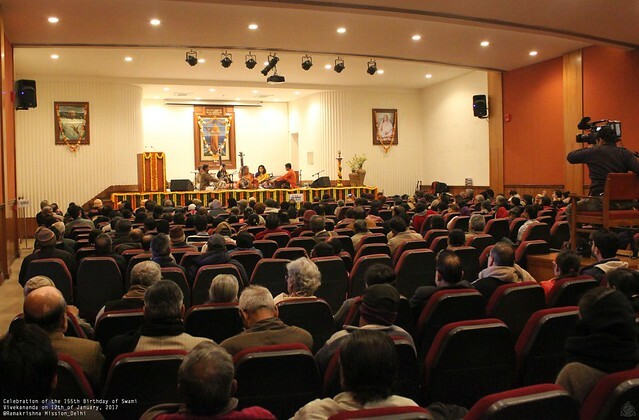 The progrmme went on excellently for two hours and the Auditorium was full with about 900 audience appreciating this performance with rapt attention. 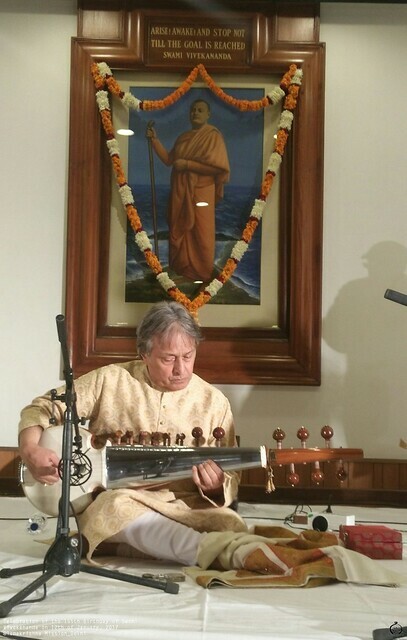 At the end of this programme, Swami Shantatmanandaji spoke a few words of appreciation for the performers and presented a shawl an Uttariya and a table calendar to Ustad Amjad Ali Khan and also an Uttariya along with a table calendar to each of the two tabla artistes for their superb performance.